Moonglow : is a fine jewelry company with a hand-crafted specialty line that casts its light across the globe garnering a solid customer base and revenues worldwide. Founded in 2003 in Montreal, Canada, Moonglow cultivates and markets a unique concept that brings jewelry to life! Artist and jewelry designer, Luc Rouleau is the mastermind behind this inspired concept. As unique and memorable a man as the jewelry he creates, Rouleau can be found in the Guinness Book of World Records for his memorization of calendar days and moon cycles. Rouleau turned his passion into practical art when he launched Moonglow. He now offers you a variety of choices including: necklaces, pendants, bracelets, anklets and rings. Each piece is designed with you in mind. Simply select a date of significance, such as a birthday, anniversary, engagement, wedding, etc. and Moonglow calculates the phase of the moon on that day. Your personalized pendant is crafted with a framed image of that moon phase. The image shines during the day and absorbs light and casts the radiant essence of your personalized moon through the darkness - a gentle reminder of the things that mean the most to you. I LOVE personalized..well.. anything. Having personalization in my life makes me feel special and reminds me that I'm unique. There is only one me. and now I can wear my personalization around my neck everyday. Who knew that one day I would own my own personalized moon? now I do! thanks to Moonglow .com I own the moon that was glowing bright in the sky 30 years ago the night I was born! Yes, the night I was born. Classic white moonphase: 6th Ascending. I can't tell you how much I am in-love with my moon. 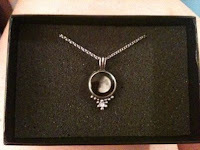 I have gotten tons of compliments and have asked about the story behind my necklace, and I love to see people's faces light up when I tell them that it's my moon. Everyone that has asked about my moon has said they will be looking into buying their own special moon. Each moon you order can have it's own special meaning. Birthdays, anniversaries, a memory of someones life, and more. I will be buying more moonglow products such as the Moonglow earrings , Bracelets , and more Necklaces , for myself and family and friends. I love that the necklaces come in Available in silver, pewter, or stainless steel. Each piece is customized to match the moon phase for the date requested. Birthstones and other stone charms can also be added for an additional fee. With your purchase you will receive a card with a code that can be entered on the moonglow website to learn more about your selected moon phase. Each piece is a personalized with the artist signature on the back. And depending on the material used and the type of jewelry selected prices vary making this the perfect gift or gift(s). With Christmas coming up Moonglow would make an amazing stocking stuffer, or just a special gift for a loved one. Moonglow jewelry is one of a kind. I have never seen jewelry like these and you will be amazed.